Due to the climate change, aging electrical systems and reckless use of electricity, Toronto, Mississauga, Etobicoke, Oakville, Brampton and the GTA entered the era of occasional blackouts. The Northeast Blackout of 2003, hurricane Sandy sidekick of 2012, Toronto Flood of 2013 and Toronto Ice Storm of 2013 are just the beginning. On the top of Big Events are dozens of small local blackouts haunting Toronto, Mississauga, Etobicoke, Oakville, Brampton and the GTA in recent years. Get ready for the Next Big Event coming to your neighborhood. It is very likely that You do not need a fully fledged, expensive, standby backup power generator kicking in some thirty seconds after a blackout or brownout started. Contact us and let The Green Electrician install the Emergency Power Generator Hookup in your home/small business. You will be pleasantly surprised at how easy and inexpensive the basic legal Emergency Power Generator Hookup is. Installation begins with the Power Inlet located outdoors, near the planned power generator. Its location protects the house's atmosphere from contamination of exhaust fumes. Properly sized conductors connect the Power Inlet with the Transfer Panel located near the Main Electrical Panel. 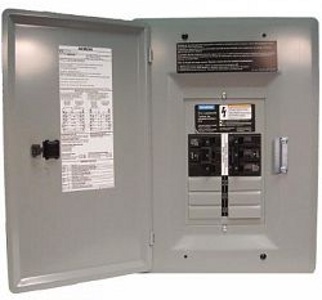 The Transfer Panel contains all critical circuit breakers for your home and is wired between the Main Electrical Panel and the critical branches of your home/small business. Beware of cheap, non certified and illegal Emergency Power Generator Hookup "simple solutions". They could lead to so called FEEDBACK, that is when power from your generator goes back into the hydro grid and could injure or kill linemen fixing the line, or an unsuspecting neighbor, and a potential manslaughter charge. Always demand electrical inspection of your Emergency Power Generator Hookup! When sizing the Emergency Power Generator system the lowest acceptable comfort level has to be defined. Generally, more critical circuits will require more kilo Watts from a stronger and more expensive power generator, using more fuel and being more noisy. 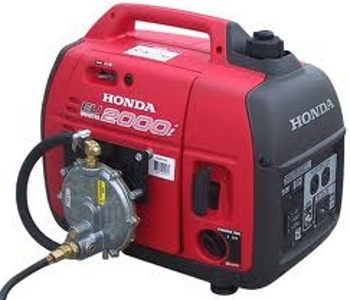 The fuel can cost from less than 20 $/day for 2 k Watts generator to well over 100 $/day for 20 k Watts generator. Noise pollution is always a problem with standby backup emergency power generator sets. In the average population density neighborhood of Toronto you can go from envy to enemy in no time. In our humble opinion the minimum backup emergency power generator has 2 k Watts peak power, triple fuel system (gasoline, Natural Gas, Liquid Propane Gas), be portable and manufactured by a reputable company (for ease of starting up and reliability). There are six basic steps to turn on/off an Emergency Power Generator. 6. turn on breakers in the Transfer Panel, one by one, as necessary. 6. turn on, one by one, ALL breakers in both Panels, as necessary.